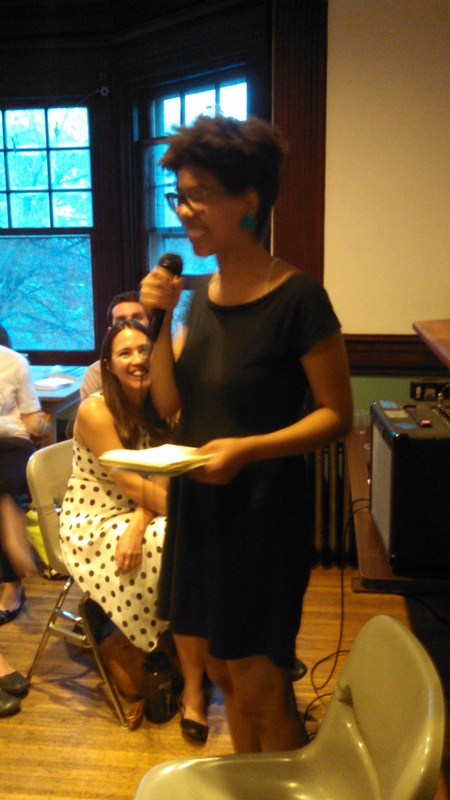 Last night was the most recent Feats of Poetic Strength, and it went fabulously. It was such a joy to hear these women’s words I’d read and fallen in love with on the page. Below are some pictures of them reading, with two exceptions. For Elizabeth Langemak and Sheila McMullin I was sitting right in front of them, and as a result took terrible photos. And part of hosting a literary series is to do your readers the favor of not releasing horrible photos of them to the wolves of the internet. Elizabeth Langemak (I will add a headshot later if I can get one–got it!) opened the reading with her gorgeous and moving poetry. I was delighted that she read this poem, “A Photograph of Her Showering,” because I had read it online and just effing loved it, so it was great to hear it read aloud. She was the perfect opener to the series, and I highly recommend following this rising star! Our next reader was Sheila McMullin (again, will post a headshot if received-got it! ), who took us on an emotional journey with her poems. Her invested performance left me on the edge of my seat. I am grateful she trusted us with her story. Poems revolving around sexual assault are a large part of the reason why I began the series, as I said last night. I want Feats to be a place for women to tell stories they might not otherwise feel comfortable sharing. Sheila’s three poems really transcended entertainment to create a deep bond between audience and poet. 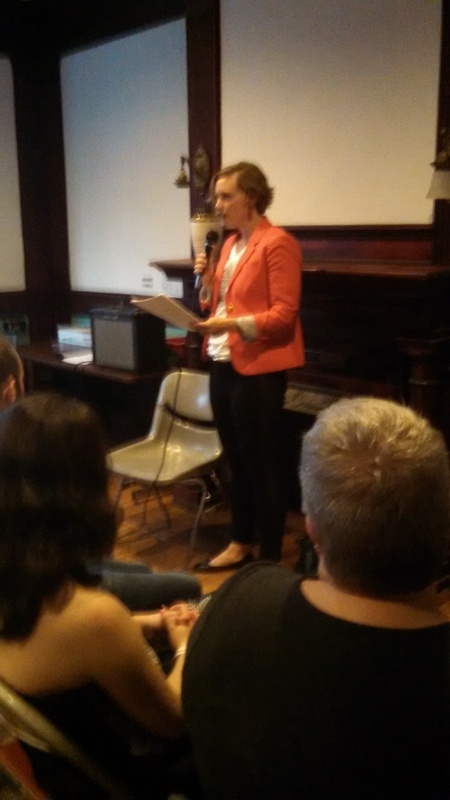 Elizabeth Hoover was next, and she read some utterly amazing poems, with subjects ranging from Coco (of Ice-T & Coco) to hysteria (a theme picked up later by poet MaryAnn L. Miller). The smart, feminist themes running through her work were so strong, and I loved what she had to say about trigger warnings. She is also just a straight up hoot. Pictured below. We then passed the hat for local feminist collective Permanent Wave Philly, and Candice (pictured below) spoke on their behalf. We raised $134 for this great group!! (That’s Sheila in the B&W dress behind Candice, offered as evidence that I did not make her up). After intermission, VCFA graduate K.T. Landon read. She had selected poems from her submission, so I was elated to hear those, plus others I hadn’t read before. Her poem, “An Andalusian Dog” astounds me, as does her great manipulation of time. I am sure she will be a name we will hear more often! 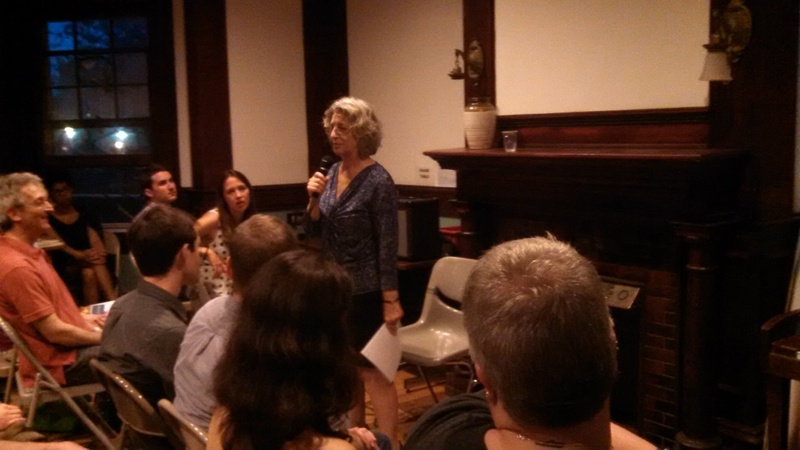 Next was MaryAnn L. Miller, who I think has a secret second career as a stand up comedian. She read poems chronicling her own diagnosis of hysteria, which was in actuality a degenerative disorder (I believe that’s the right phrase). Her poems tackled this difficult subject wryly, and with wonderful imagery that enabled the audience to picture the intangible. The poems she read were from her new manuscript she is working on with Feats alumna Hila Ratzabi. Closing out the show was poet and all around wonderful woman Anne-Adele Wight. She gave us a wonderful mix of environmental poetry and poems with female themes. 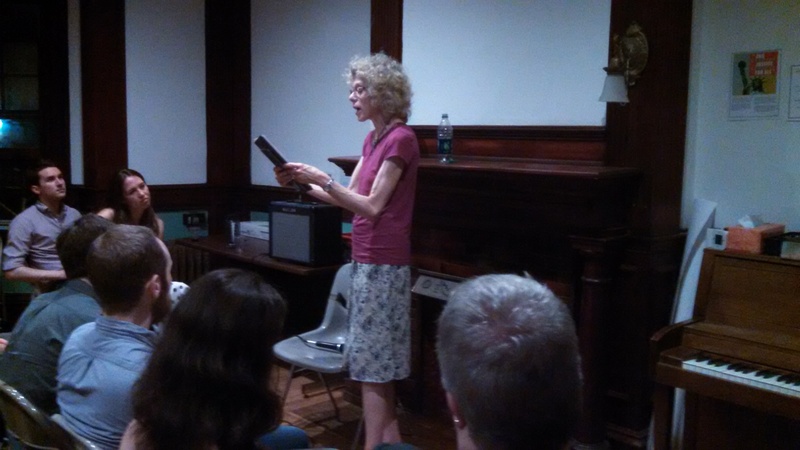 I am grateful she was able to step in to read, and her closing poem, “Cat Pills,” ended the evening on just the right note. Thank you so much to them for reading, and to the audience for listening. I am grateful to you all for helping this vision to become a reality. I would gush on and on, but I am off to bake cookies at a friend’s house, because it’s Sunday, and life is quite wonderful.